Back in 2011 blogs (here, here, here) and papers (here, here, here, here) described a widely used Malware technique to hide malicious actions called: Process Hollowing. Nowadays we are experiencing some "flashbacks" to this delightful technique, so I decided to write a little bit about it, just in case someone needs a "refresh". 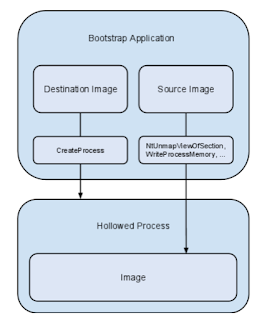 Process hollowing is a technique used by some malware in which a legitimate process is loaded on the system solely to act as a container for hostile code. At launch, the legitimate code is deallocated and replaced with malicious code. The Malware starts a legitimate process by using the CreateProcecess within CREATE_SUSPENDED flag enabled in the fdwCreate. // This function is used to run a new program. It creates a new process // and its primary thread. The new process runs the specified executable // file. // and the creation of the process. // and does not run until the ResumeThread function is called. The process has been created and it's in suspended state. Now it's time to hollow the legitimate code from memory in the hosted process. We might use the following API (ZwUnmapViewOfSection). // the same Windows Native System Services routine. // the virtual address space of a subject process. // the virtual address space of a process. The Malware then allocates memory for the new code by classically using VirtualAllocEx. The Malware should ensure the code is marked as writable and executable (by using flProtect). // space of a specified process. 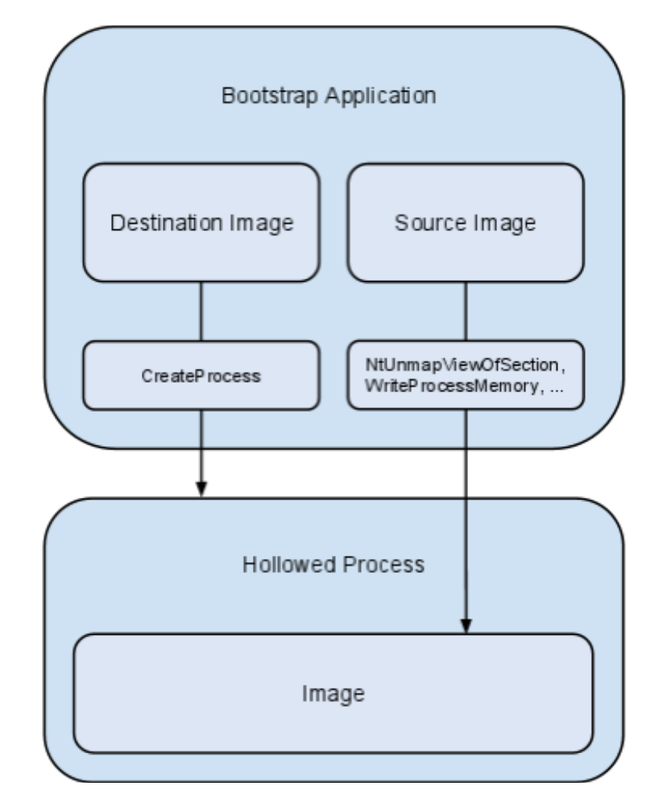 Now it's time to write the malicious code into the hollow host process using the romantic WriteProcessMemory. // area to be written to must be accessible or the operation fails. in order to camouflage the Malware, the author should re-set the normal pagination schema by setting Read/Execute protections like any other normal process by using VirtualProtectEx. // address space of a specified process. It should also set the remote context to point to the new code section. The SetThreatContext API has been used to reach the scope! // Sets the context for the specified thread. It's time to resume the suspended thread (ResumeThread) and "game over" ! // decremented to zero, the execution of the thread is resumed. We've just fired up a brand new (and potentially malicious) process! Focusing on detection, it is going to be hard if using static signatures (such as AntiVirus romantic signatures) but having the possibility to dynamically analyse system calls (such as a sandboxed environment) the detection rate will increase drastically. It happens from time to time people asking me what are the most "notorious hacking groups". On February 2015 I wrote a little bit on most notorious group in 2015 (here) but today things changed a little bit. It's hard to answer to such a question since we need a strong definition of "notorious", do we mean the most known groups ever ? Or do we mean the most successful groups ? Or, again, the ones who attack few big organisations or the ones who attacks successfully millions of user PCs ? OK, we might go forth forever on that, so I'll give my personal point of view (which is debatable) based on my findings and on my daily activities. Pawn Storm, (Operation PawnStorm) is for sure one of the most interesting hacking group we might observe nowadays. It is an active economic and political cyber espionage operation that targets a wide range of high-profile entities, from government institutions to media personalities. Its activities were first seen as far back as 2004, but recent developments have revealed more concrete details about the operation itself, including its origins and targets. Regin. I've been writing about Regin (here) and at that time it was mainly considered an attack. Nowadays after several observable attacks we think it 's most a group of people who built sophisticated attaching tools. Regin, first identified in 2008, is a highly complex threat used by the APT group for large-scale data collection and intelligence-gathering campaigns. The development and operation of this threat would have required a significant investment of time and resources. Threats of this nature are rare and the discovery of Regin serves to highlight how significant investments continue to be made into the development of tools for use in intelligence-gathering. Many components of the Regin tools remain undiscovered, and additional functionality and versions may exist. Emissary Panda. Discovered in 2015 but active since 2013 E.Panda is a Chinese Hacking group targeting US-Military and US-Defense infrastructures as well as critical infrastructures in USA. The attackers used contractors Managers and Directors to exfiltrate classified information from secret projects. The attacks conducted using the Win32/Potao malware family span the past 5 years, the first detections dating back to 2011. The attackers are, however, still very active, with the most recent infiltration attempts detected by ESET in July 2015. Waterbug. Discovered and described by Symantec (here) Waterbub was operating since 2005. Waterbug is likely a state-sponsored group which uses an attack network (“Venom”) that consists of 84 compromised domains (websites). The watering-hole websites used by the Waterbug group are located in many different countries. The greatest number of compromised websites are found in France (19%), Germany (17%), Romania (17%), and Spain (13%). Dragonfly, likely a group of hackers operating out of Eastern Europe since 2011, bears the hallmarks of a state-sponsored operation. Analysis of the compilation timestamps on the malware used by the attackers indicate that the group mostly worked between Monday and Friday, with activity mainly concentrated in a nine-hour period that corresponded to a 9am to 6pm working day in the UTC +4 time zone. Sandworm. Known for its most famous (so far) APT called BlackEnergy (here). Built from Russia against Ukraine during the political conflict Sandworm is a skilled group specialised in SandBox evasion tricks and documents (OLE) worms. Several English-speaking developers began creating custom malware and using it as a group in 2015. GovRAT is the name they gave the malware – which is used primarily for cyber espionage, and is also the code name of the group, the hackers using it for infections. Among these groups plenty of famous smallest and biggest groups are out there, some of there are notorious as well while some other are stille hidden, so please consider that list incomplete and based on personal experiences and not on scientific review process.